A . If there is paradise on earth, it is here, it is here, it is here...said Amir Khusrow, Sufi musician, poet and scholar about Kashmir. Eons ago Kashmir conjured up images of beauty — Dal Lake, boat houses and snow capped mountains. But now, Kashmir has become synonymous with turmoil. That's why Mehvish Mushtaq is like a breath of fresh air. 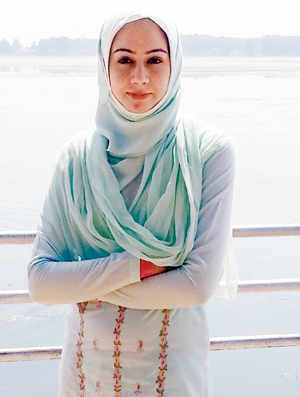 She is the first Kashmiri to develop an Android app — Dial Kashmir, which has become an almost mandatory application to have on one's smartphone in Kashmir that has a population of around five million. She says she created the app with an aim to facilitate communication processes within the Kashmiri society. Is there a lane that leads to your house that is water logged because a pipe burst, and you are clueless as to how to get in touch with the local municipal department? There's a fire that needs to be put out? You need to contact a hospital or a newspaper office or get a gas cylinder delivered? These might seem like simple tasks in a city like Bangalore. But in a conflict-ridden Kashmir such problems take on a different hue. Step in Dial Kashmir, which is now into its fifth version, with Mushtaq working on the sixth. Mushtaq who graduated in Engineering (Computer Science) describes herself as a tech savvy person. "Technology has always fascinated me." In the winter of 2013, she did an online course on Android application development. As a part of the course, she was supposed to make an app. "I decided to develop something that would be useful to the local people," she says. "The fact that whenever someone needed a contact number of a particular service, the process to obtain the information was not easy; sometimes the official sites were broken and sometimes you couldn't find the number at all. All this motivated me to create the app." Dial Kashmir (a name suggested by her best friend) caters specifically to the Kashmir region. It gives users extensive information such as addresses, phone numbers and email ids of essential and commercial services in various sectors. In addition to that it also includes features such as prayer timings, railway timings, a flashlight, pin codes, ISD code etc. The app first become operational on February 28, 2013. Mushtaq, now known as the Android girl, has been getting "appreciative" mails from all over the country. She says the app has not contributed much "materially. But the success gave me confidence and made me more outspoken." And a new beginning and something to rejoice — for everyone who is bombarded with news about a troubled Kashmir at the other end.